I was born in an impoverished town in north-western Myanmar (Burma). My parents were animists. I was born in an impoverished town in north-western Myanmar (Burma). My parents were animists. My father often made sacrifices to the spirits. I was often spellbound by my father's ritual incantations when he made sacrifices to the gods. Naturally, I became an atheist. I almost fell to the ground with laughter when a friend told me God had created the first man from dust! It was the most hilarious joke I had ever heard! And it was also the first time I had heard the word God. But the idea was absurd and simply ridiculous to me. But while I thought it was a huge joke, I became interested to know the "God" my friend was talking about. One day, by chance (or Providence), I saw a group of Christians worshipping on Saturday. I was invited to join the children's class, which I did. I was fascinated by the Bible stories and began attending church every week. In time I accepted Jesus and was baptised. The baptism was such a joyful experience that I wished Jesus would return the next day! That marked the beginning of a new experience and also the struggle to be faithful in the stewardship of time, talents and money. Occasionally, I received pocket money from my uncle and some other "good Samaritans." Usually the amount was 1 kyat or less (1 kyat = 100 pyaas), enough to buy me three bananas or two mangoes for lunch. In my mind, a gift (especially money) was an income, and therefore, should be tithed. But I was too shy to put 10 pyaas into the tithe envelope. So I hid the coin in the forest until I accumulated more coins. My first tithe was 25 pyaas (three steel coins). The amount was so small that I wondered if God would care about it. At that time I'd not heard the story of the poor widow with two mites (Mark 12:42). But my new faith in Jesus and the desire to be right with God were greater than the possible ridicule of others. 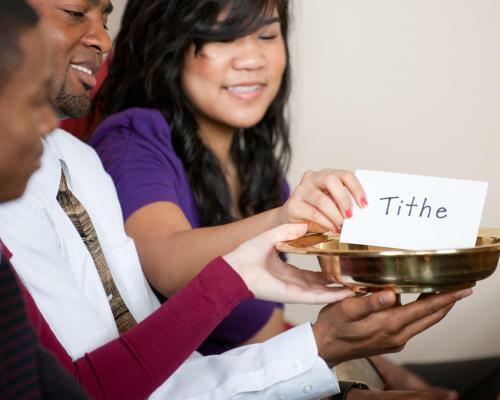 I was so embarrassed by the small amount that I made sure nobody saw me put the coins into the tithe envelope. Notwithstanding the small sum, it gave me huge satisfaction to faithfully return my tithe. I knew in my heart that if I was faithful with my money, God had many more blessings in store. The real test of Sabbath-keeping came in my final year of high school. At the time, the high school exam was the most critical exam for students in Burma. The outcome of the exam determined one's career options. The exam was so important my teachers decided to open classes on Saturday. I had two choices: go to school on Sabbath and pass the exam; or go to church and fail. I chose neither! I wanted to follow God's command and still pass the exam. So I started to fast and pray every Sabbath for wisdom and power to overcome temptations. And I faithfully attended church every Sabbath. When the results of the exam came out only a handful of students passed, and I was one of the three students who passed with an "A" grade. I couldn't hold back my tears of joy when my name was mentioned on national radio. I realised that faithfulness to the divine call to keep our time with Him each weekend had given me a handsome dividend. After my exam, I continued the habit of praying and fasting every Sabbath for the next four-and-a-half years! I finished high school with flying colours but my parents couldn't afford to send me to college. Besides, I did not want to go to a government school in my country; I wanted to study at an Adventist college abroad. I fasted and prayed week after week, month after month, and year after year, but nothing seemed to happen. In 1994, I went to Malaysia and worked as a waiter to save money for college. But most of my salary went to support my family. At my rate of saving, it would take me about 20 years to go to college! I would need nothing less than a miracle for my dream to come true. Undeterred, I continued to fast and pray every week. One day, while sitting in church, a friend touched my shoulder and said, "I'd like to talk to you after worship." dumbfounded. I was wondering how he knew my desire, despite the fact that I had not told him anything. After regaining my composure, I said, "You know, I've been fasting and praying every Sabbath for more than four years to be able to go to college. Until now I've not received an answer from God." "Maybe this is the answer," he said confidently. Indeed, it was the answer to my prayer. And perhaps God's way of opening "the windows of heaven" (see Malachi 3:10) when we are faithful to the resources He entrusts to us. I have never regretted putting God first in the management of my time and money. The more we put our trust in Him, we discover the blessings multiply exponentially. I know it by experience. Your heavenly Father already knows all your needs, and he will give you all you need from day to day if you live for him and make the Kingdom of God your primary concern. Matthew 6:32, 33. Jeffrey Pum Lian Pau pastors the Eastside Adventist church in Hamilton, New Zealand.